New York Democrats in Congress are staying silent after Rep. Ilhan Omar (D., Minn.) called the 9/11 terror attacks "something" done by "some people." Speaking to the Council on American Islamic Relations at a March fundraiser, Omar discussed the difficulties Muslims faced. She claimed they saw their civil liberties infringed upon after the Sept. 11, 2001, al Qaeda attacks. In those comments, she referred to the events as "some people [who] did something" and praised CAIR for organizing in response. "CAIR was founded after 9/11, because they recognized that some people did something and that all of us were starting to lose access to our civil liberties," she said. "So you can't just say that, ‘Today someone is looking at me strange. That I am going to try to make myself look pleasant.' You have to say, ‘This person is looking at me strange. I am not comfortable with it. I'm going to go talk to them and ask them why.'" The Daily Caller picked up on Omar's language in a story, which quickly spread online. The story drew condemnation from others, including Rep. Dan Crenshaw (R., Texas). Crenshaw is a former Navy SEAL who served in Afghanistan, Bahrain, and South Korea. He called Omar's comments "unbelievable." "It is deeply disturbing that a sitting Member of Congress would trivialize the deaths of thousands of Americans, one of the most pivotal events in U.S. history," Rep. Lee Zeldin (R., N.Y.) told the Washington Free Beacon. He called the events of 9/11 "a terrorist attack that to this day continues to take the lives of our fellow countrymen." One New York Democrat Rep. Max Rose responded on Twitter to Omar's comments. "Let’s be clear, words matter: we were attacked by terrorists on 9/11. Thousands were murdered, too many of whom were from my district," Rose said. Let’s be clear, words matter: we were attacked by terrorists on 9/11. Thousands were murdered, too many of whom were from my district. But actions matter too. So let’s do the right thing and #Renew911VCF. No other New York Democrat in the Senate or House of Representatives has commented on Omar's comments. None replied to several messages from the Washington Free Beacon before press time. Meanwhile, Omar responded to Crenshaw's comments, claiming his reaction to her 9/11 remarks constitute "dangerous incitement." She claimed it was never acceptable to challenge her patriotism. "My love and commitment to our country and that of my colleagues should never be in question," she said. "We are ALL Americans!" Crenshaw had not questioned her patriotism, saying as much in a reply Wednesday afternoon. However, Omar has questioned the loyalties of others. In May 0f 2018, Omar accused President Donald Trump of disloyalty. He is "not a patriot," she said at the time. 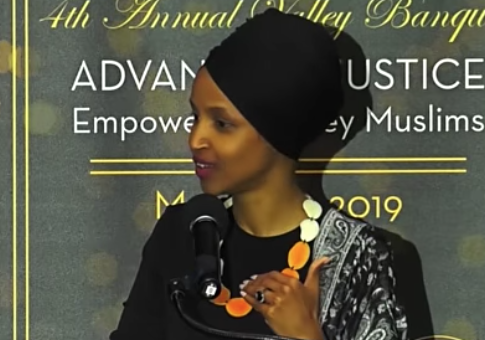 In February, Omar peddled in anti-Semitic stereotypes, claiming an ambitious pro-Israel bill was the product of financial persuasion. "It's all about the Benjamins baby," she said, alluding to $100 bills. Shortly after, Batya Ungar-Sargon of the liberal Jewish Daily Forward called the remark "the second anti-Semitic trope you've tweeted." Ungar-Sargon had previously defended Omar's comments in the past. She asked Omar who would be "paying American politicians to be pro-Israel." Omar replied, "AIPAC!" Omar later deleted that tweet. Later in February, Omar told an audience that some in the United States insisted on fealty to foreign powers. "I want to talk about the political influence in this country that says it is okay for people to push for allegiance to a foreign country," she said. The comment provoked condemnation from members of both parties. In March, Omar made additional comments. After Rep. Nita Lowey (D., N.Y.) tweeted, "Omar continues to mischaracterize support for Israel," Omar responded that members of Congress should not be "expected to have allegiance/pledge support to a foreign country." Lowey, who previously condemned Omar's comments about Israel, did not reply to a request for comment about Omar's 9/11 remark. You can watch Omar's full remarks here. UPDATE: The article was updated to include Congressman Rose's comment, which he tweeted after this story was published. This entry was posted in Politics and tagged Dan Crenshaw, Ilhan Omar, New York, New York City, September 11. Bookmark the permalink.